Most of the ‘Circus’ riders still in Spain at the end of September began to congregate at a very pleasant international beach camp site at Badalona, just north of Barcelona. Having set up camp we went off looking for the race organisers as most of us did not know if our entry applications had been received and accepted for the meeting. It turned out the meeting had been heavily oversubscribed and with the organisers giving priority to the Spanish manufacturers entries, all of which had been accepted, it was not surprising when some of the privateers found their entries had been excluded. In my own case I had been accepted for the 125 race but not for the 250 race which was disappointing. The equivalent of only £50 for one start was not going to improve my overall financial standing very much! Still, at least I had a ride and a slim chance of gaining some prize money. Some of the Circus riders without starts decided to move on which left our group somewhat depleted by the following morning. Another reason why I was particularly anxious to obtain an entry for Montjuic was that this was the home base of Mototrans, the Spanish affiliate company of Ducati Italy. Representatives of Mototrans had approached me in Albi back in June, with a proposal for me to consider riding for them in 1965. It is time I think for me to explain exactly what transpired in Albi and how Vic and I came to meet the representatives of Mototrans Espania. Back at Albi in France, during the morning practice period, we had noticed two rather smartly dressed individuals walking around the paddock but did not take much notice of them at the time. When the afternoon sessions were over they came and congratulated me on my riding and on the way we were representing Moto Parilla. They seemed very keen to know what our relationship was with the Parilla factory and the status of our current racing program in Europe. They told us that they were involved in the automotive industry but did not inform us, at this stage, of their connection with Ducati Racing. The following morning, after I had competed in the 125 race, these two gentlemen again came over in the paddock and on this occasion introduced themselves as the Manufacturing and Technical Development managers of ‘Mototrans’ Ducati Racing. 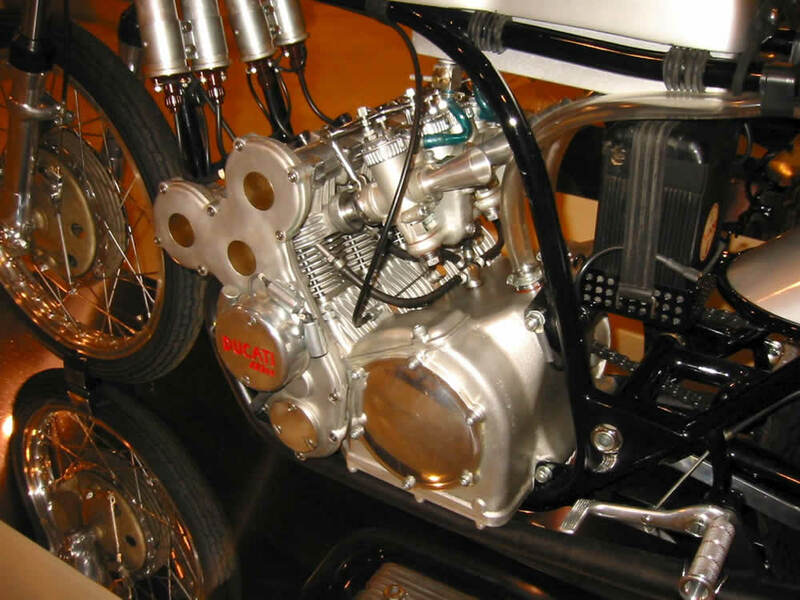 They explained their company was well advanced in the development of 125 and 250 twin overhead cam 4 cylinder racing engines and they were now seeking to appoint an International rider to campaign their racing machines throughout Europe in 1965. They asked if I would consider riding for them and also help in the development of their racers and having received a positive response, they proposed that Vic and I should visit the Mototrans workshops in Barcelona at the earliest opportunity. After some further discussion, it was agreed that on the following day Vic and I would leave Albi and drive directly to Barcelona via Andorra for a meeting with them and other managers of the company, on the following Tuesday morning. We were asked to keep our discussions confidential for the time being which we were more than pleased to do as we did not want half or more of the riders currently in the paddock chasing after a potential ride with Ducati! Two days later we turned up at the Ducati Racing factory in Barcelona as planned only to find that the two managers we had met in Albi had been called, so we were told, to an urgent meeting in Madrid and that they would not be returning to the Barcelona factory until Wednesday evening at the earliest. Instructions had been left for us, on our arrival, to be given a tour of the factory and the opportunity to see the new 125 and 250 race engines running through test programs in the engine test cells. Both engines were shown to be able to run at over 14,000 rpm and power outputs in excess of 22 and 42 H.P respectively were recorded, nearly twice the power of my Parilla engines! We were most impressed with everything we saw at Ducati and I would have signed up to ride for them there and then, had I been given the opportunity. Unfortunately, having a race meeting scheduled for the following weekend in Shleiz, East Germany, there was no way we could delay our departure until the Thursday as was now being proposed to us. Having explained the position and our continuing interest in working with Ducati Racing to a member of staff who spoke good English, including our intention to return to Spain in August for the start of the Spanish series, we took our leave and set out for Germany but not before crossing town and completing 2 or 3 laps of the Montjuic circuit in the Thames. When I arrived in Bilbao for the first of the races in the Spanish series I had more than half expected Ducati Racing to contact me, particularly as they had a works team entry with Franco Farne riding the factory Ducati, but to my disappointment they did not. Neither of the Managers we had met in Albi was in attendance at the Bilbao meeting Again in Valladolid and Jerez I had hoped Ducati Racing would contact me but they did not. Sitting having coffee at the Badalona camp site pondering on the best way for me to make direct contact with Ducati Racing, one of my racing pals came up and informed me he and two other riders were off to visit Ducati Racing and invited me to go along! The issue of confidentiality with Ducati Racing was very much at the back of my mind but I nevertheless decided to go along just to see if I could find out what Ducati were up to. Arriving at the Ducati Racing engine development department, we were given the same tour as Vic and I had had back in June. 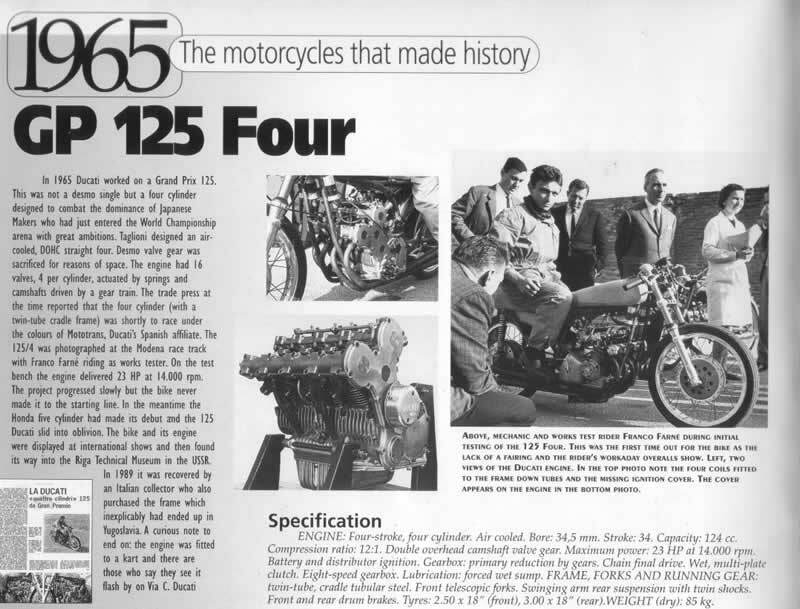 There were 5 or 6 of the new multi cylinder125 and 250 racing engines in various stages of build and 2 complete engine mounted on dynamometers in the test cells but these were not running at the time of this visit. There was no sign of the two Managers I had met in Albi but I recognised the guy who had shown Vic and I around in June and he discreetly took me aside from the others explaining, with some embarrassment, that one of the managers I had met in Albi was no longer with the company and the other had been transferred to the company’s Madrid office. He told me there were strict budgetary constraints in place and that he was also waiting to see what the future plans for the racing team would be. So that was that they had run out of money! – I suppose all dreams must come to an end sometime. Back to racing and Montjuic Park. The following day we arrived at the circuit to find that the racing was only to be over a small section of the famous original circuit. The section of the original circuit we were to run on was connected by a series of inner link roads within the Park. I and some of the other riders were not at all impressed and considered some sections of the circuit to be dangerous. The starting grid was on part of the original circuit and for the first half mile or so was just great with fast sweeping curves, the problems started when we left the original circuit and turned right into what was no more than a rough surfaced uphill link road lined with trees, all very close to the circuit with no barriers for protection! Things got even worse when at the end of this section the circuit crossed a central junction in the middle of the Park. The circuit was so poorly delineated at this point that in practice I saw 2 or 3 riders leaving the intended route and shooting off down the wrong road! The intended route was for riders to take the second right hand turning at the central junction and then sweep through a long downhill left hand curve before linking up once again with the original circuit but this time, running in the opposite direction before turning back in the right direction at a section which I described at the time, as ‘The bus stop’! For me, the worse part of the circuit was the long left hand downhill curve. It seemed that this section of the road had originally been built with cobblestones on which a very thin coat of tarmac had been laid. No matter what I did with my front suspension or tyre pressures, I just could not stop the front wheel chatter and the high resonance vibration which went right through the whole bike each time I road through this section of the circuit. Once back on the section of the original circuit, everything was just fine again! From the start of the 125 race I knew I was in for a tough ride and half the field must have been ahead of me before we even got to the top of the circuit. I just could not find a line to take through the dangerous downhill section where I was losing out to most other riders. Half way through the race when perhaps concentrating too much on the front end, I lost the rear when the wheel stepped out and very nearly had me off the bike! At around 15 laps into the 20 lap race, Ramon Torras and another Spanish rider swept past on their “works” machines as they lapped me on the downhill section of the circuit. I was so demoralized at this point that I decided to call it a day and retired at the pits (the bus stop) next time around.This was the only time I ever retired from a race other than when crashing or my bikes breaking down! I was feeling very disappointed things had not gone well for me in the race; it did not help me feel any better when one of my pals came up to ask why I had retired and informed me I had been running in 6th place when I came in – in effect I had just given around £25 away! Leaving Badalona I decided to try and forget the disappointments of this visit and when I came to write up my memories of events some 46 years later, I found that I had almost succeeded!